Quality. Innovation. Convenience. 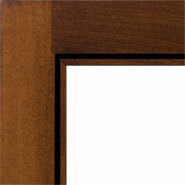 Designer Face Frames make it easy to have classy, designer-inspired looks that set your cabinetry apart from the rest. The Square Notch (FE-3) frame modernizes the traditional beaded frame by giving it squared edges, making it a perfect fit for design styles that highlight clean, straight lines.